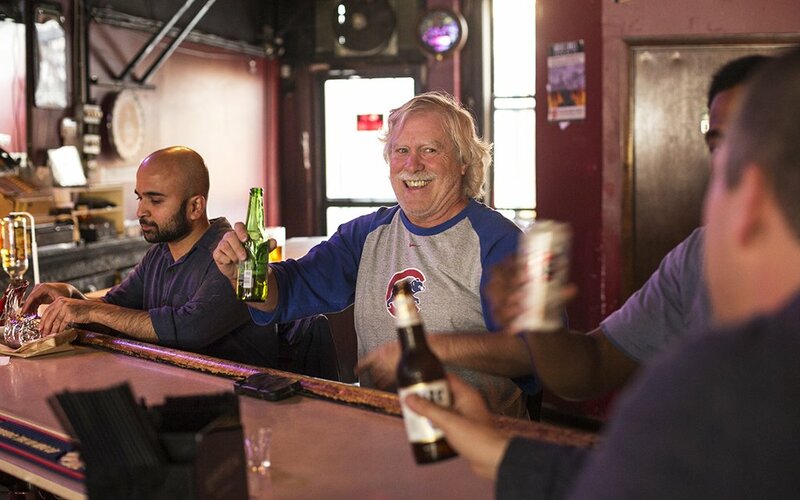 Chicago is home to plenty of great watering holes, but none is more beloved than the corner bar. 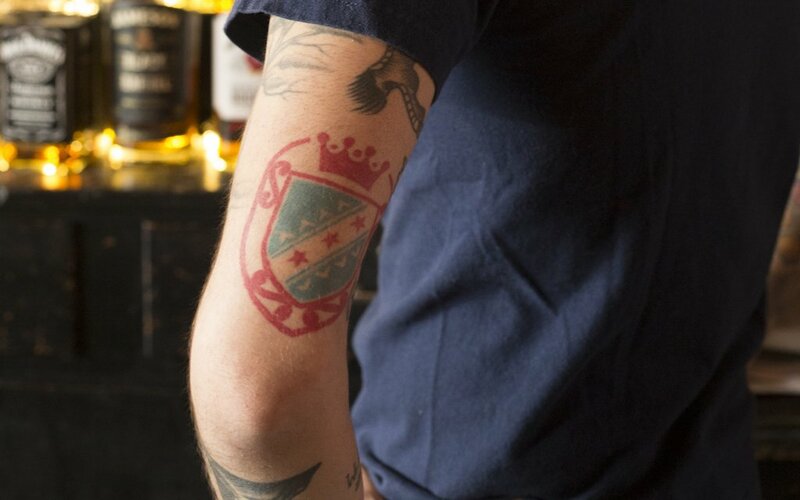 Hence we bring you Know Your Corner Bar, a monthly, ahem, dive into the tales and characters behind one of the city’s most storied taverns. 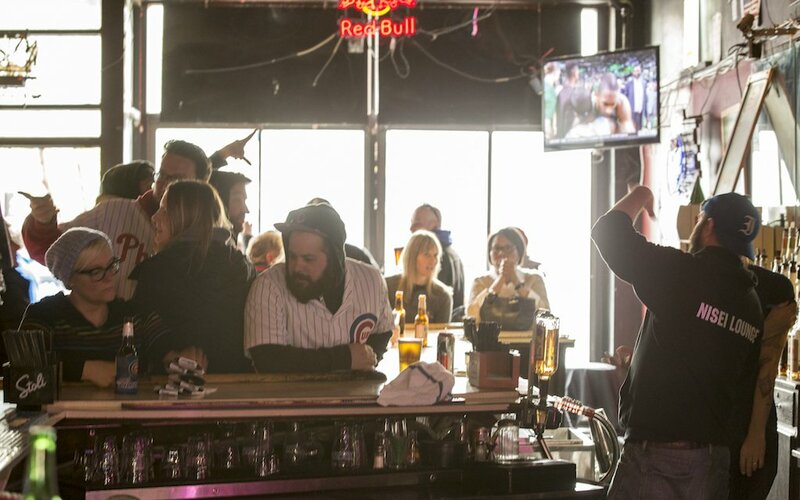 It’s a few days after Malortmas — aka the annual Nisei Lounge Christmas party — and almost two months since the Chicago Cubs’ historic rally to capture their first World Series in 108 years, when partner Craig Morrall finally starts scrubbing the dried splatters of champagne off the ceiling. One of the bartenders, Alana Kolar — who goes by “Lou” — objects. A few regulars chime in and trade barbs. Lou’s right: You can’t just wipe away a celebration a century in the making. It’s Cubs history. Six months later, it’s still up there. 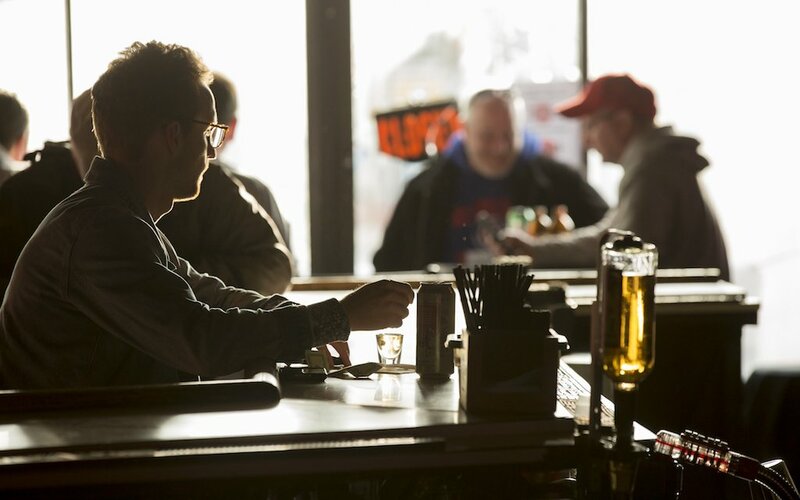 Nisei Lounge has stood on the corner of Clark and Sheffield since 1951. 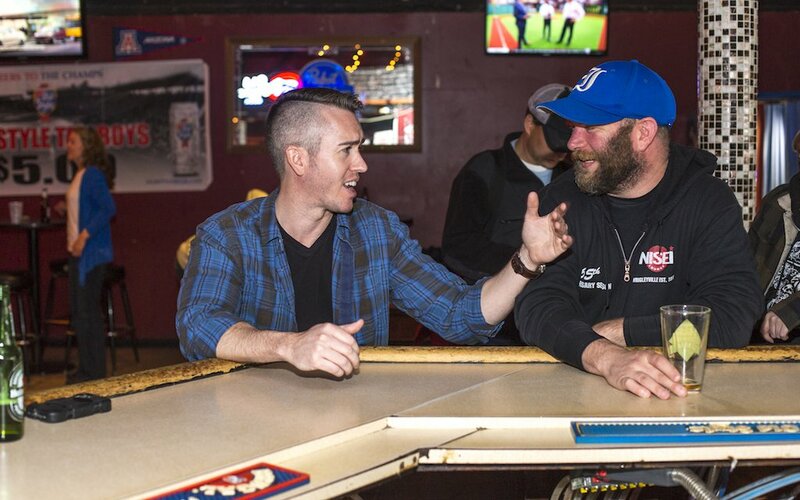 And save for the 80-year-old Murphy’s Bleachers — known as “Ray’s Bleachers” before it was taken over by Jim Murphy in 1980 — it stands as Wrigleyville’s oldest bar. Meaning they’ve been serving the neighborhood for roughly 10,000 Cubs games (still a losing record overall, the owners are quick to remind us). 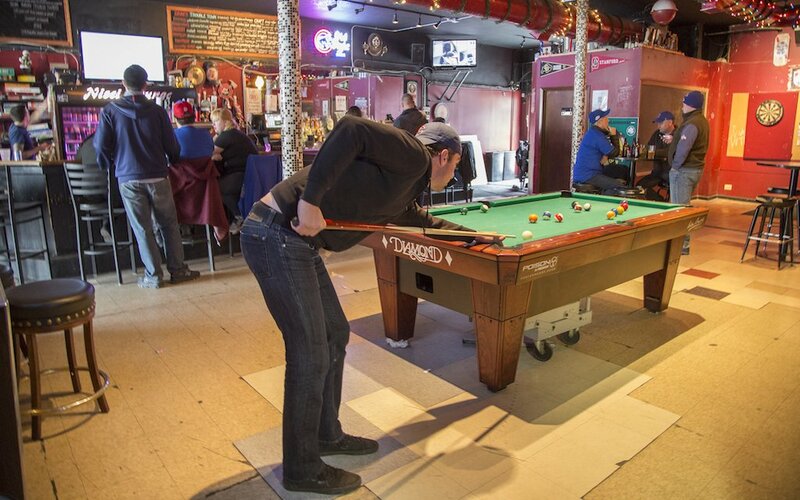 And while the area around the 66-year-old dive bar has undergone massive changes, Nisei has remained the same: a place to tie one on respectably, which is all that is required of it and all that can be said for it. You’re not alone if the name throws you at first. “Nisei” (pronounced knee-say) means second-generation Japanese immigrant, reflecting a time when Wrigleyville was an enclave for Japanese-Americans who were relocated here after President Roosevelt closed the last of the Japanese internment camps late in World War II. The bar opened in 1951 as a spot for Nisei to drink and trade stories while their kids hung out at the then-diner next door. By the ‘70s, most of them had moved to the suburbs. Now their grandkids make the trek to see their grandfathers immortalized in old photos by the entrance. 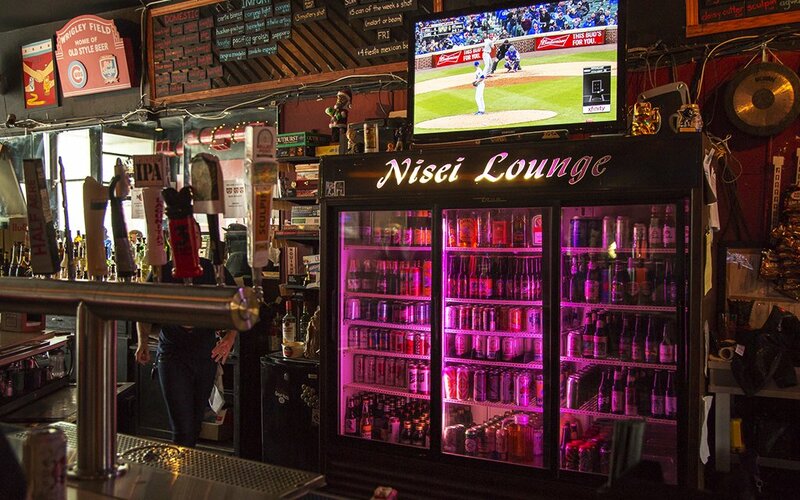 Like a lot of regulars, I’d started coming to Nisei before and after games in my 20s to drink cheap Old Style and escape Wrigleyville. It’s dark and quiet, with the smell of stale beer and sweat, and you can almost always find a seat. So it goes for a good dive. 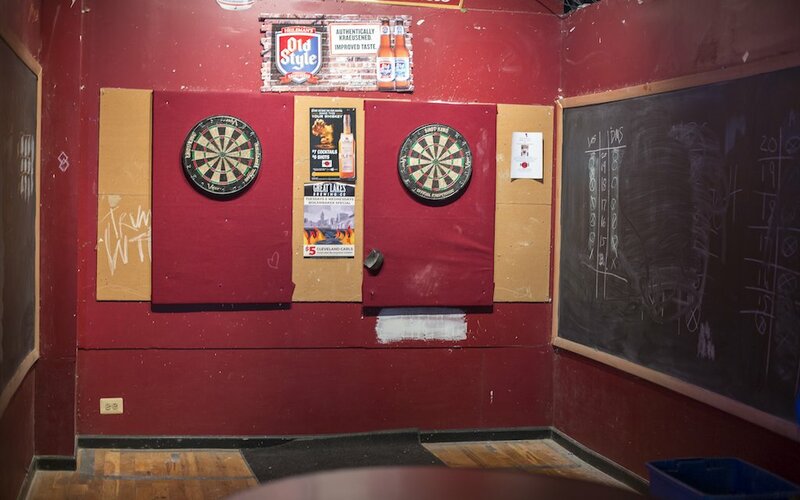 There’s pool, real darts and cheap pints, and they claim to pour more Malort than any other Chicago bar besides maybe the Green Mill. Oh, and half the bartenders are White Sox fans. 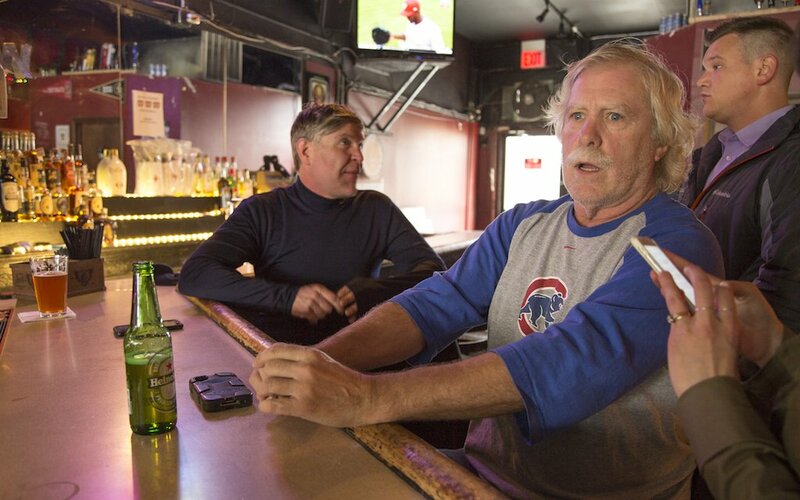 When Craig Morrall and his cousin Brian Pistorius bought the bar six years and some 1,000-plus Cubs games ago, regulars — like 22-year patron Roger, who’s lived in the neighborhood since 1965 — were worried. 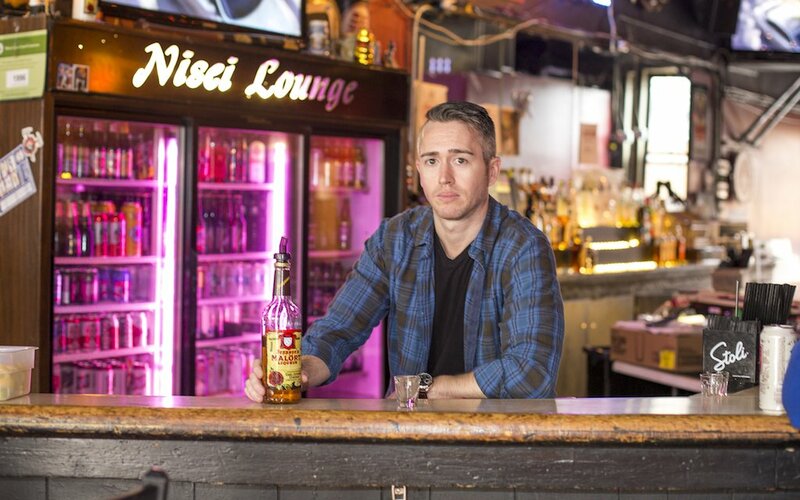 “I look for bars like this — with a good feel and good neighborhood crowd,” he says. “Roger was very nervous at the beginning,” Pistorius remembers. 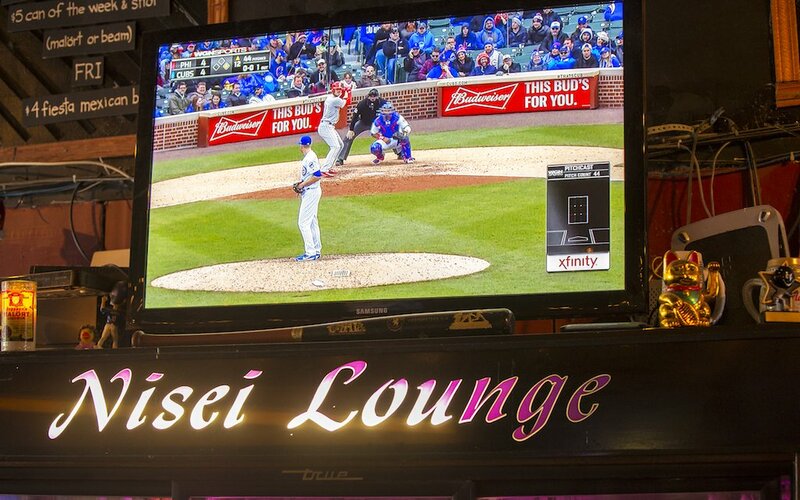 “He thought we’d turn it into another Wrigleyville bar.” But aside from cleaning up the bathrooms and adding a couple flat-screen TVs, Nisei’s soul is intact. Historically, April has been the best-performing month, when the weather is still crap but everybody’s excited that baseball’s back. But this past October, post-season baseball blew those numbers out of the water. The whole staff was on call, and weekly beer deliveries became daily. On the night the Cubs clinched the National League Championship Series over the San Francisco Giants, Nisei nearly ran out of draught beer. Pat Odon, whose official title is “Beer and Baseball Operations Director” (really), resorted to showing anxious patrons photos of the 800-can “strategic reserve” of Old Style he keeps in the cellar. During the World Series, Nisei saved half the capacity for regulars and their friends, though Roger was pissed they took out all the barstools. Like a lot of neighborhood spots, the bar did raise drink prices, save for draft Old Style and Roger’s beloved Heinekens. For the first home game of the Series, it also reserved seats for the first time in its history: $100 a pop for unlimited beer and Dimo’s pizza. The series, of course, well … we all know what happened. The day of Game 7, people started showing up at 2 p.m., five hours before the first pitch. 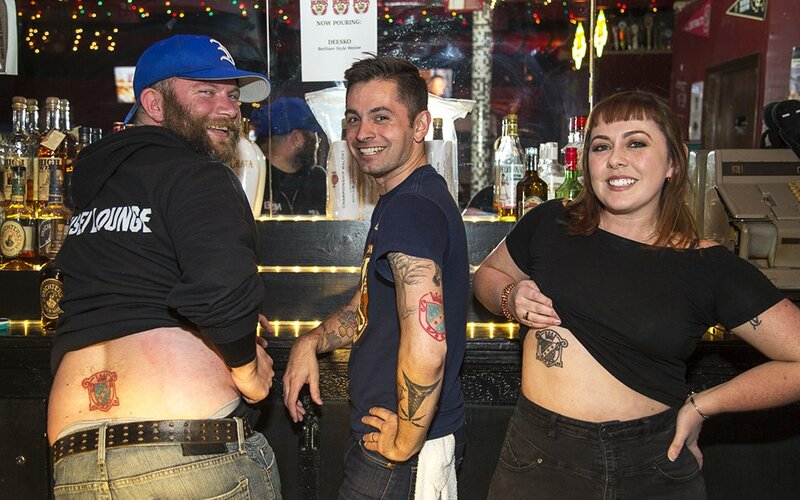 By 5 p.m., the bar was packed to its 190-person limit, with another 60 people in line outside. As the game wore on, all eyes were glued to the see-sawing lead changes on screen; beer orders slowed to a trickle. The line outside dwindled to six people who’d been out there since before the first pitch. They finally got in during the 17-minute rain delay after the ninth, just in time for Ben Zobrist to smack a tiebreaking RBI double in a two-run 10th, lifting the Cubs to an 8-7 victory. People screamed and hugged; a few shed tears. 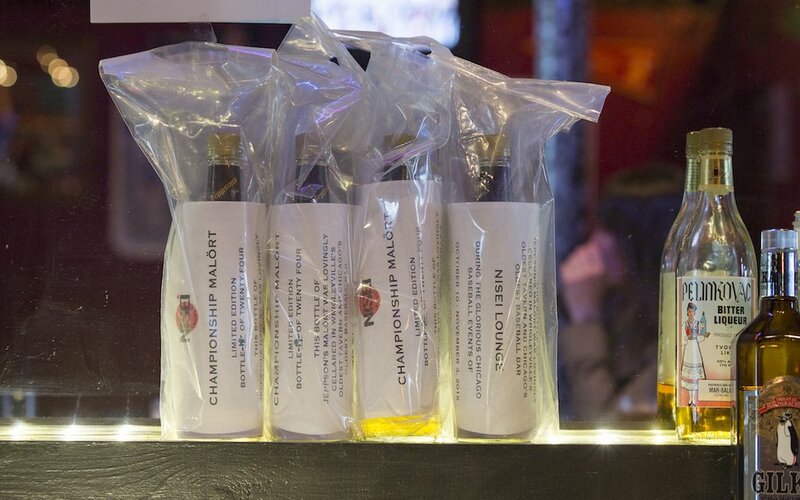 Everyone left Nisei soaked in cheap — mostly screw-top — champagne. (“I really screwed that up,” Odon says.) 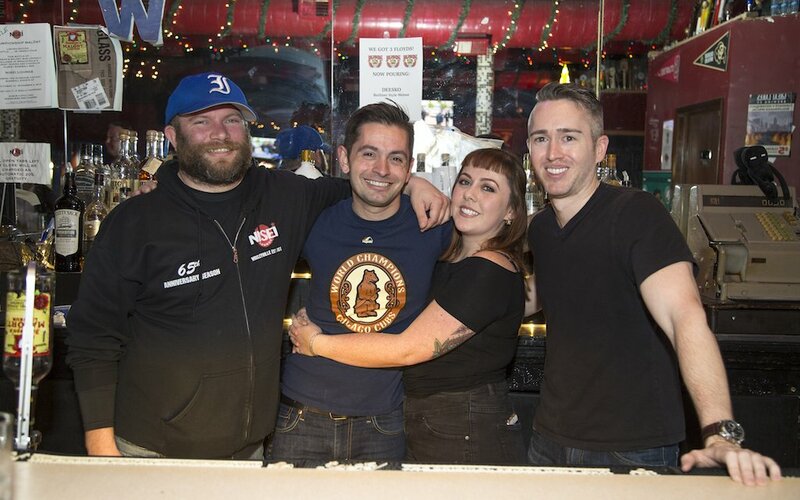 A massive staff party ensued, culminating with bartender Wyl Villacres falling asleep in a box in the basement sometime after 4 a.m.
For days, emotional fans kept flooding the neighborhood. 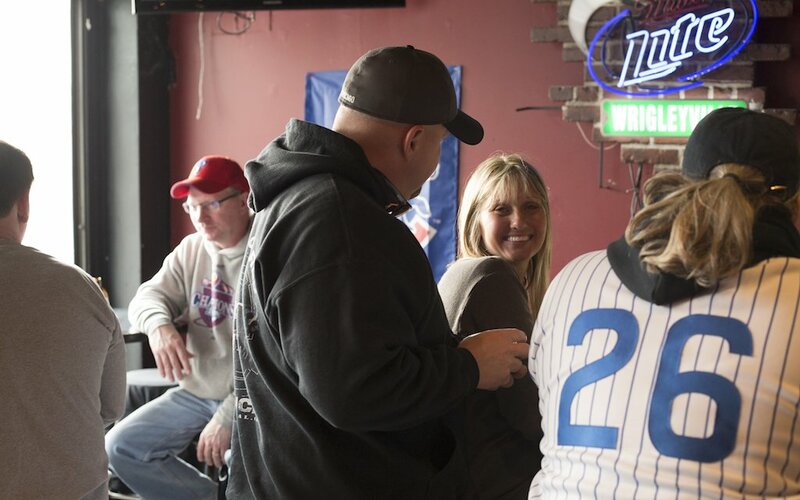 On Rally Day, a woman came into the bar holding a small ziplock bag with some of her father’s ashes. 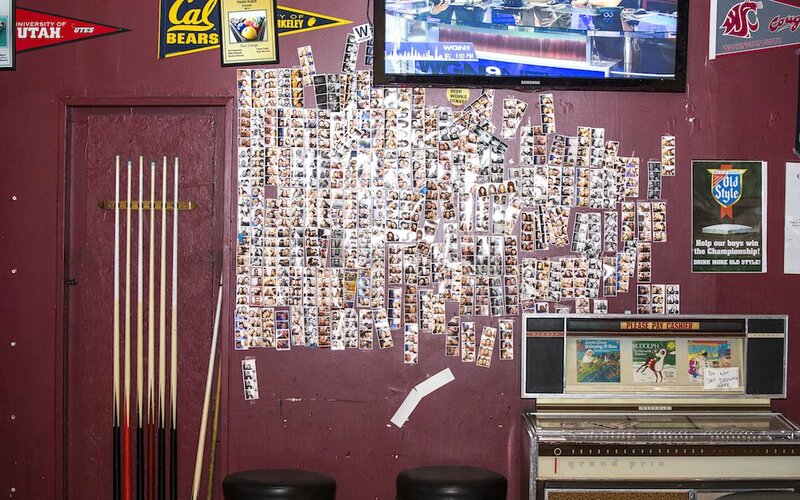 “Oh, he would have loved this bar,” she sighed. “Mind if I…?” She gingerly sprinkled a few pinches of Dad near the door, and left. Now another season is underway, but everything feels different. The delightfully nonsensical car wash across from the stadium is now a shiny multi-level complex of team offices, parking and a Starbucks Reserve. The old McDonald’s whose bathroom I used after beer-soaked games in the bleachers is gone. So is Bookworks, the beloved used bookstore across the way. A whole block of Clark St. bars was razed to make way for the Addison Park rental towers — which will also house a movie theater, bowling alley and a few chain restaurants. It remains to be seen, of course, whether all this will be enough to lure people to the ‘hood year-round. It’s a mild afternoon in early May, and I’m back at Nisei to watch the Cubs play the Phillies at home. It hasn’t been a great start to the season for the defending champs, but they eke out a 5-4 win in extra innings. Wyl rings the Old Style bell and bangs the gong, and “Go Cubs Go!” starts up on the sound system. 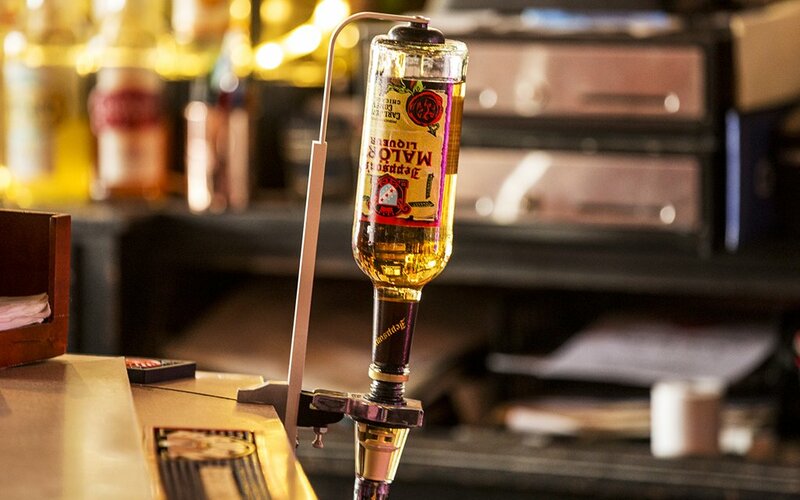 Everyone sings along if they’re not draining their beer or masking Malort Face after downing a victory shot. Roger smacks me on the back between high fives. The early-evening sun shines through the front window, flooding the bar with rare natural light, and I suddenly remember something Odon told me a few weeks earlier. “All we’re really doing is trying not to screw this up,” he’d said, gesturing around.